Ever wondered how rockets create all that trust to blast off into space? Queue Tom Mueller, SpaceX’s Vice President of Propulsion Development, who will tell you all about it with his narrated schematic of SpaceX‘s Merlin rocket engine here. Don’t forget to toggle the full screen option. Of course, this engine isn’t your run of the mill rocket engine, if there is such a thing. According to Mueller this 140,000-pound-thrust Merlin 1D has the highest thrust-to-weight ratio of any rocket engine ever made, and they are made in-house! Not something that was planned originally but unworkable supplier demands and high proces meant they went for it by themselves. This decision did probably not only save the company millions in the long run but also secured SpaceX‘s status as one of the leading companies in the industry, with the technical know-how to prove it means business. This entry was posted in News, SpaceX, Technology and tagged Falcon, Merlin, Mueller, rocket engines, SpaceX on June 26, 2013 by Space 51 Team. 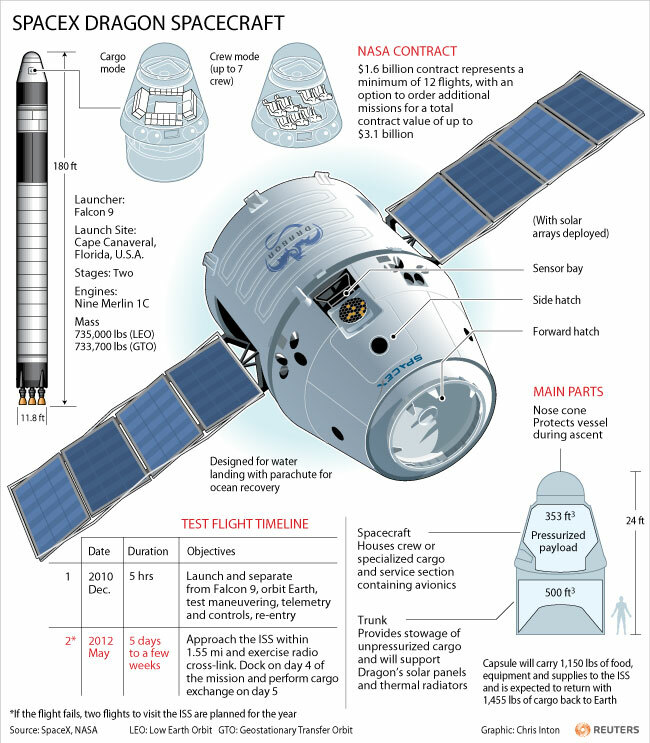 In May of last 2012, Dragon became the first commercial spacecraft to successfully rendezvous and connect with the International Space Station (ISS) and with that it put SpaceX firmly on the map. For those curious on how that would have looked like, check out the following link and make sure to drag your cursor around. Resupply missions aside (regular cargo flights started in October 2012), SpaceX is developing a crewed variant of the Dragon called DragonRider, which will be able to carry up to seven astronauts to and from low Earth orbit – those seven will probably be best of friends by the time they arrive as the pressurized part of the capsule is only 10 cubic metres “big” inside so it will be quite a cramped ride. For a time table of milestones to look forward to, December 2013 will see a pad abort test (in which Dragon will use its abort engines to launch away from a stationary Falcon 9 rocket – it’s one of the safety tests required), followed by an in-flight abort test coming April 2014 (same test, but this time in flight), and the first crewed Dragon (DragonRider) flight is currently scheduled to happen mid-2015. The last in a series of impressive feats will then see a crewed spacecraft dock with ISS no sooner than December 2015. This entry was posted in News, SpaceX, Technology and tagged Commercial Spaceflight, Dragon, DragonRider, Musk, NASA (United States), SpaceX on June 16, 2013 by Space 51 Team. SpaceDev, a subsidiary of Sierra Nevada Corporation, is developing a very cool looking seven-seater spacecraft called Dream Chaser, designed to launch astronauts into space using the by now well-established Atlas 5 rocket. Think of the spacecraft as a mini-shuttle – it’s about four times smaller and based on designs that NASA and Russian engineers experimented with in the 80’s and 90’s, using on-board propulsion systems derived from SpaceShipOne and SpaceShipTwo’s hybrid rocket motor technology – technology being designed and developed by Sierra Nevada Corporation (SNC) for Scaled Composites. No word as of yet about cost for potential passengers, but the primary Dream Chaser Space System mission is to provide NASA with a safe, reliable commercially-operated transportation service for crew and cargo to the ISS and back to Earth and not just to carry out low Earth orbital flights. Closer to reality, SpaceX (Space Exploration Technologies) will be happy to fly you into low Earth orbit in their Dragon capsule, launched on top of their Falcon 9 rocket as soon as 2015. But as if that isn’t exciting enough yet, Elon Musk announced that he will be looking to send people to Mars for a cool half a million dollars – not too bad when you put it in perspective. It will be a trip of months, not hours at only a few times the cost of a low orbit ride. Elon Musk might truly be the real Tony Stark – where is the suit though? SpaceX confirmed in 2012 that their target launch price for crewed Dragon flights is $140,000,000 which means a solid $20,000,000 per seat if the maximum crew of 7 is aboard – still about 3 times cheaper than Soyuz but cheap it is not! If you are looking for the feeling of weightlessness without actually becoming an astronaut and losing a fortune doing so, then there’s an astronomically cheaper option out there. Zero Gravity Corporation (also known as ZERO-G) is an American company in Virginia that offers flights aboard a cargo plane that goes into a parabolic arc. This way, it actually simulates weightlessness for its passengers, at a mere $4,950, plus tax. A flight lasts 90 to 100 minutes, and consists of fifteen parabolas, each of which simulates about 30 seconds of reduced gravity: one that simulates Martian gravity (one third of Earth’s), two that simulate Lunar gravity (one sixth of Earth’s), and 12 that simulate weightlessness. That’s value for money if you ask us! Next time, what is Amazon.com founder Jeff Bezos up to, and more! This entry was posted in News, SpaceX and tagged Commercial Spaceflight, cost of space travel, Dragon, Dream Chaser, Falcon, SpaceDev, ZERO-G on June 11, 2013 by Space 51 Team.